Say it in the yard with a yard card! 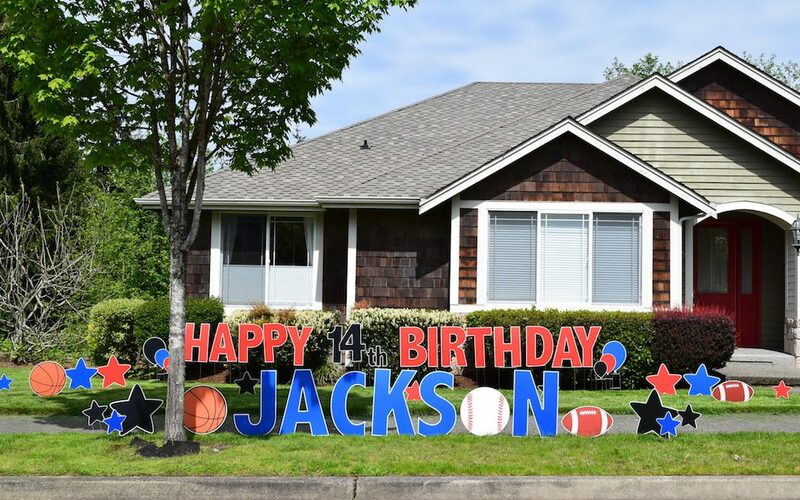 We can customize a festive outdoor message and decorate your lawn for you with our alphabet/number signs along with fun characters and figures that match your party theme, or your loved one’s personality and interests. Choose a standard decoration package or customize your own! We do all the work – delivery, set-up and pick up! They make perfect party decorations for a milestone birthday like the first birthday, sweet sixteen, 40th birthday, 50th birthday, 100th birthday or any birthday in between! Our festive yard signs make great surprise gifts for that hard to buy for person, and they will remember your thoughtful gift for a lifetime. Lawn displays are very popular for graduations and can be customized with most local school colors. Special occasions like the 25th Silver Anniversary, Golden 50th Anniversary and retirement are the perfect occasion for a yard card! Our yard sign decorations also make super fun and memorable prom-proposals, homecoming or dance invitations, or over the top marriage proposals!